Pay with iDeal or Creditcard for delivery in 2 workingdays! Would you like to give your frogs a personal touch? 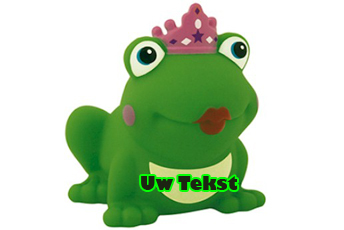 We give you the opportunity to have a print on your frogs with for example a logo or some text. We also have special labels and stickers. Bag of 144 small frogs (2,5 cm) in four colors. Set of 4 frogs in a bag. The toothie duck toothbrush holder is about 9 cm high. The greatest ducks for every occasion you find in De Badeendwinkel. For a wedding, birth, birthday, anniversary etc etc we have the biggest collectionof ducks. You can also have your ducks personalized!